Showing results by narrator "Sue Williams"
Sue Williams has delivered us Women of the Outback and Outback Spirit, stories she gathered from the people of the bush. 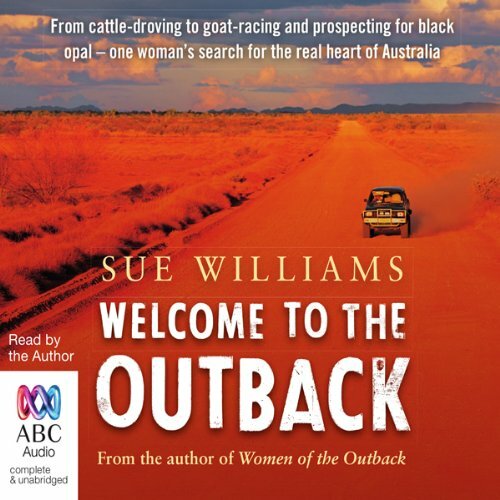 Ever curious, this time Sue puts herself in the firing line, seeking to find the essence of the outback experience - perfect for all us armchair travellers. She travelled the width and length of Australia by bus, train, car, campervan, Troopy, horse, goat, foot, and plane. She helped pregnancy-test cattle at a remote property in the far north of South Australia, swallowed countless flies, and ran through muddy dams carrying a pretend-sheep on her shoulders.